The new issue 2(3) of Migration Studies is out. It contains a short symposium on the impacts of irregular status with contributions by Elzbieta Gozdziak, Janina Sohn, Daniela Borodak and Ariene Tichit. Using ethnographic methods, Gozdziak examines how irregular immigration status affects the educational opportunities of children in the US, concluding that ‘the kind of assistance and support Latino students need will not come solely from immigration reform and policy changes, but rather paradigm shifts in our attitudes toward and programs for Latino children and their families as well as policies aimed at alleviating poverty of immigrant families’ (Gozdziak, 2014, pp. 392–414). The nexus immigration status and educational attainments is the focus also of Söhn’s article (2014). Borodak and Tichit explore the impact of status on migration projects and conclude that, while ‘the total duration of migration to a foreign country is the same for regular and irregular migrants”, irregular migrants move less due to constraints of status (Borodak and Tichit, 2014, pp. 415–447). Closely related to the theme of the symposium, this Migration Studies issue also includes a review essay by Franck Duvell on “Human smuggling, border deaths and the migration apparatus” (Duvell, 2014). The collection also includes three theoretically driven pieces by Oliver Bakewell on the ‘re-launch’ of migration systems theory (Bakewell, 2014), Roger Waldinger on an agenda for a sociological engagement with ’emigrant politics’ (Waldinger, 2014); and Cheng, Young, Zhang and Owusu on a comparative exploration of internal migration in China and the EU (Cheng, Young, Zhang and Owusu, 2014). An editorial by Alan Gamlen introduces the collection. Migration Studies, published by Oxford University Press, invites proposals for a Special Issue on themes of enduring significance in the study of human migration. In 2015, the journal aims to publish a guest-edited, thematically coherent collection of approximately six articles of 7-9000 words in length, based on original, unpublished research on a topic of importance to the interdisciplinary field of migration studies. Priority will be given to comparative work as well as methodological and theoretical advances, and we explicitly welcome work that is grounded in a specific discipline but engages across disciplinary boundaries. Themes concerning the full range of migration drivers, dimensions and impacts will be considered. Migration Studies aim to publish a special issue in 2015. This is contingent on review and revision time, and therefore we strongly prefer proposals for collections of articles that have already been drafted and reviewed in light of substantive feedback from a range of colleagues. Deadlines: The deadline for proposals is 1 May 2014. Full articles should be ready for submission at that time or very shortly afterwards. Review Process: All articles submitted undergo the standard Migration Studies peer review process and those accepted will be published in the journal. How to submit: proposals should be submitted online at http://mc.manuscriptcentral.com/migration, under the manuscript category ‘Special Issue Proposal’. – 100-word biographies for each contributor, detailing discipline, area of expertise, institution, and position. Migration Studies is an international refereed journal dedicated to advancing scholarly understanding of the determinants, processes and outcomes of human migration in all its manifestations. It furthers this aim by publishing original scholarship from around the world. Migration shapes human society and inspires ground-breaking research efforts across many different academic disciplines and policy areas. Migration Studies contributes to the consolidation of this field of scholarship, developing the core concepts that link different disciplinary perspectives on migration. To this end, the journal welcomes full-length articles, research notes, and reviews of books, films and other media from those working across the social sciences in all parts of the world. Priority is given to methodological, comparative and theoretical advances. The Office for National Statistics has released its quarterly update on UK net migration. This time the figure, 183,000, is ‘favourable’ for the UK government. This is a drop of about 25% from the previous quarter, mainly the result of the increase emigration of Britons is search of better opportunities abroad (this is what migration is mostly about) and the recent UKBA’s scaremongering campaign against universities and further education colleges (e.g. London Met) that has made the UK a less attractive destination of overseas students. But what exactly ‘favourable’ means here? 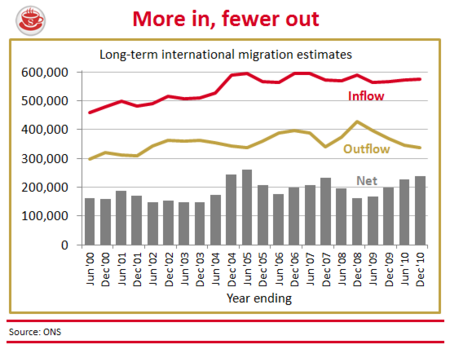 As I have argued in the past on this blog, the UK government’s decision to use the quantum of net migration as an indicator of its success or failure in relation to the governance of migration is questionable for multiple reasons. I discussed this in a talk on ‘Unwanted’ immigrants and the liberal state I gave last year at the Alumni Weekend at the University of Oxford. My talk starts at 17’52”. The Arab Spring has not radically transformed migration patterns in the Mediterranean, and the label ‘migration crisis’ does not do justice to the composite and stratified reality. From the outbreak of the popular uprisings in North Africa and the Middle East, European media and politicians were preoccupied with the prospect of ‘tidal waves’ of North Africans reaching Europe. These sensational predictions lacked any scientific basis so it should come as no surprise that they have not come true. Nonetheless, migration in its various forms has played a key part in the uprisings that spread across these regions. The columns of vehicles escaping from cities and villages under siege in Libya, the migrant workers awaiting repatriation in the holding centres in Egypt and Tunisia, the boats crammed with Tunisians and sub-Saharan Africans crossing the Mediterranean Sea and landing on the island of Lampedusa, and the numerous Egyptian émigrés and university students returning to Cairo to join the protests in Tahrir Square are a few examples of the ways in which human mobility has intersected the events in North Africa. Recent migration events are not simply a side effect of the revolutions. The possible links between declining opportunities for migration from North Africa to the EU (due to the economic crisis and intensified border controls) and the exclusion and discontent of disenfranchised youth on the one hand, and the protests on the streets of Tunisia, Egypt, Libya, Algeria and Morocco on the other, deserve closer consideration. As a starting point it seems useful to distinguish between the uprisings themselves, and the subsequent transition and consolidation of new political regimes. This allows a clearer overview of mobility patterns, the various ways migration and forced displacement have intersected with the popular uprisings over time, and the models of engagement adopted in this rapidly changing political situation by international agencies that otherwise would be lost in the generic label ‘Arab Spring’. This quote from a public lecture at Harvard University in April 2012 reflects a remarkably candid assessment of the ambiguity of response by the EU and its Member States to the migration flows associated with the political instability and economic insecurity in North Africa and the Middle East. The array of documents, policy statements and position papers issued over the last year by EU institutions highlights an anxiety about the exodus of North Africans towards the northern shores of the Mediterranean Sea. While this exodus never happened, the powerful image of an ‘invasion’ – with the Italian island of Lampedusa acquiring an iconic status – has certainly permeated public perceptions and the policy responses of EU Member States. The EU’s response to this conflict-related migration in North Africa has also demonstrated the tension between internal and external dimensions of migration governance. The EU’s Global Approach to Migration and Mobility paper (GAMM)1 of November 2011 tried to reframe the EU’s approach around four “equally important” pillars: facilitating regular migration and mobility; preventing and reducing irregular migration and trafficking; maximising development impact; and promoting international protection and “enhancing the external dimension of asylum policy”. While this is a step in the right direction by apparently shifting away from a unilateral bias on security issues, the GAMM still remains locked into the false and misleading dichotomy of ‘legal’ and ‘illegal’ migration (even though with a softer tone). The centrality of migration enforcement and control is still paramount and the strengthened role of Frontex2, which saw its operational budget rocket from €6.3 million in 2005 to nearly €42 million in 2007 and topping €87 million by 2010, symbolises this priority. The reality of the deaths at sea of an estimated 2,000 migrants in 2011 alone, at a time when the Mediterranean Sea had become one of the most militarised and heavily patrolled areas of the globe, is a stark reminder of the gap between EU rhetoric and actual practice on development and human rights. The social and political unrest and the popular push towards more democratic governance in North Africa have upset the cosy relationship and collaboration on migration issues between European and North African governments. In the years preceding the revolutions, the EU and its North African counterparts thought that the problem of the crossing of the external borders of Europe by ‘undesirables’ was, if not solved, at least beginning to be overcome. In addition to increasingly restrictive immigration regimes, the EU externalised border controls to North African countries through initiatives such as the bilateral agreements between the former Libyan regime and Italy, or Tunisia and France, or Morocco and Spain. Rather than stopping migration, this has increased the irregular character of migration and has led to a geographical diversification of overland and maritime migration routes in and from Africa. This has made migration more costly and risky for migrants, and increased their vulnerability to exploitation and suffering. EU policy makers seem rarely to consider these side effects. The hundreds of thousands of sub-Saharan and other migrant workers stranded in Libya during the civil war who sought refuge across the Egyptian and Tunisian borders suddenly exposed the scale of intra-African migration to the global public. Overall, migrant workers from more than 120 countries were displaced during the conflict. Eurocentric accounts of the Arab Spring almost completely ignored the profound impact of the Arab Spring on countries of origin. This pertains not only to the possible role of returnees in the recent political violence in countries like Mali but also to the fact that many families in extremely poor countries are now deprived of vital remittance income since migrant workers returned home from Libya. In many ways, returnee migrants moved from one situation of insecurity to another. Many displaced people were migrant workers who had lived in Libya for years. In the wake of the conflict most of them have tried to return home, discrediting the idea that the Arab Spring would cause a mass exodus to Europe. However, the most vulnerable group consisted of migrants and refugees who were not able to return because it was too dangerous and/or because they lacked the money and contacts to facilitate their flight. They have become trapped in a situation which the migration researcher Jørgen Carling has aptly described as “involuntary immobility”. Others did not necessarily aspire to return, as they had fled insecurity, persecution and deprivation in their own countries, and had often been living in North Africa and the Middle East for many years or even decades. These include sub-Saharan and Tuareg migrants in Libya; Iraqis, Palestinians and Somalis in Syria; and Sudanese and Somalis in Egypt. Political instability, economic crisis, increasing costs of living and unemployment, and the increase of insecurity (due to reduced policing) have made these groups more vulnerable than they were already. Mass flight has been largely confined to Libya and there has been no major increase of emigration from other North African countries. The increase in Tunisian emigration was facilitated by reduced policing during the revolution but stood in a long-standing tradition of irregular boat migration to Europe that has existed since southern European countries introduced visas for North Africans around 1991. It is rather unlikely that the revolutions will drastically change long-term migration patterns. The same processes that have created the conditions for the revolutions are also conducive to emigration, and the two phenomena may reinforce each other. In the region, a new generation has grown up, better educated, with wider aspirations and more aware of opportunities elsewhere and injustices at home than any previous generation, but at the same time feeling rejected and angry due to high unemployment, corruption, inequality and political repression. The coming of age of a new, wired and aware generation of angry young men and women has increased both the emigration and the revolutionary potential of Arab societies. Even under the most optimistic scenarios, the idea that emigration will stop is as unlikely as the idea of a mass exodus towards Europe. Certainly, a populous and deprived country like Egypt seems to have a significant emigration potential for years to come. However, whether these migrants will go to Europe or elsewhere primarily depends on future economic growth in Europe and elsewhere. At the same time, it is likely that the Libyan oil economy will continue to rely on migrant labour, and Egyptian and sub-Saharan migrants have in fact started to return there. For political elites in the region, migration has fulfilled an important role as a safety valve, since the opportunity to migrateoverseas relieved unemployment, discontent and internal political pressures for reform. This lack of migration opportunities may perhaps have turned the attention and anger inwards, and tipped the balance in favour of revolutionary forces. Besides, political exiles and emigrants played an important role in supporting the revolutions, certainly in Tunisia and Egypt. What will be the impact of political reforms and possibly more democratic modes of governance on migration and migration policy? Some observers argue that the more conservative, religiously inspired nature of current and future governments may possibly increase migration aspirations among secular elites, minorities and women, whose rights might possibly be impinged upon. On the other hand, possible increases in respect for human rights for their own citizens may also push North African societies to become more reflective and self-critical towards xenophobia and violations of the rights of migrants and refugees, and make their governments less willing to collaborate with the security-focused immigration policies of European countries. Hein de Haas hein.dehaas@qeh.ox.ac.uk is Co-Director of the International Migration Institute www.imi.ox.ac.uk Nando Sigona nando.sigona@qeh.ox.ac.uk is a Senior Research Officer at the Refugee Studies Centre www.rsc.ox.ac.uk.